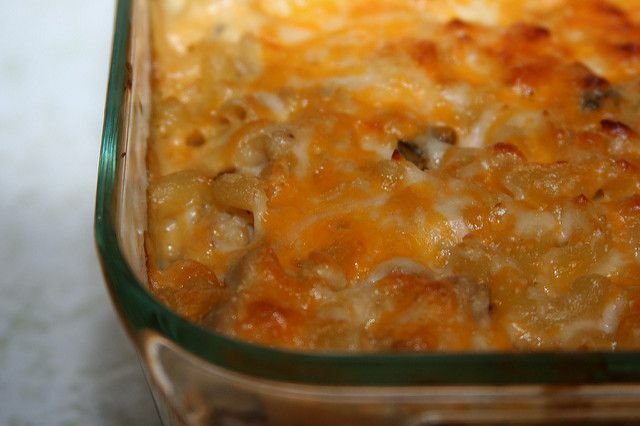 This casserole is the next best thing to real pierogi when time is a consideration. It's a meatless, layered affair that uses lasagna noodles in place of pierogi dough and cottage cheese in place of farmer's cheese. The dish comes together in a snap especially if you use oven-ready lasagna noodles. It's a great brunch/buffet offering that can be made ahead. Soak noodles in warm water for 30 minutes, making sure they don't stick to each other. Meanwhile, in a medium pot, boil potatoes in salted water until tender. While potatoes are cooking, mix together cottage cheese, egg, and 1/4 teaspoon onion salt, and set aside. When potatoes are tender, mash them and stir in Cheddar cheese, 1/4 teaspoon regular salt, remaining 1/4 teaspoon onion salt and pepper, and set aside. Heat oven to 350 degrees. In a 9-inch-by-13-inch pan that has been lightly coated with nonstick spray, place 3 drained noodles horizontally. Spread cottage cheese over the first layer of noodles. Lay down another 3 noodles. Spread mashed potato mixture evenly over the second layer of noodles. Cover with another 3 noodles. Spread 1/2 cup caramelized onions evenly over the third noodle layer. Cover with remaining 3 noodles. Mix remaining 1/2 cup onions with bread crumbs and spread over the top of the last noodle layer. Cover casserole dish with foil and place on a pan to catch drips. Bake for 30 minutes or until the dish is bubbly. Uncover and bake 5 minutes more. Let stand 10 minutes before cutting into squares as for lasagna. Serve with sour cream and chopped dill, if desired. Make Ahead: Prepare recipe as directed. Do not bake. Cover with plastic wrap, then foil. Refrigerate up to 24 hours or freeze up to 2 months. When ready to bake, remove plastic wrap and replace foil. Bake refrigerated casserole about 40 minutes and frozen casserole about 1 1/2 hours.